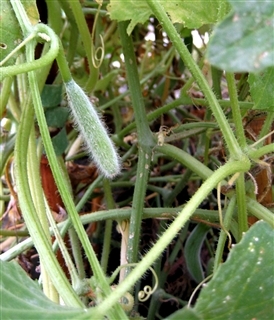 Mia's Garden: What's UP with these cucumbers?! What's UP with these cucumbers?! OK.. I won't plant this variety again! to come off of the same plant? And the strangest thing of all is that they are FUZZY !! Unfortunately, I didn't save the tag to know what kind this was. and have a few to cut up in a salad. I guess I'll consult the Burpee catalog next time around. "Give Thanks in ALL things"! and they grew despite the heat & bugs! ANYONE HAVE A GOOD RECIPE FOR SWEET RELISH? 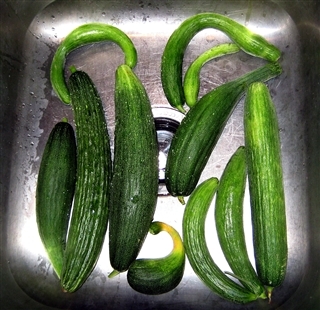 It looks as if you had some dark green Armenian cucumbers. They do extraordinarily well in the heat! The trick is to pick them at the right stage. They are naturally burpless and bitter-free. They also tend to resist a lot of the diseases that regular cucumbers succumb to. I grow quite a few of these varieties, if you are interested in trying some with stripes or that are round, at cucumbershop.com. Thanks! You are right! Now that I think about it, they look similar to the ones I've seen in the store. I was thinking I'd planted just plain ol'generic cucumbers. Glass Totems of my OWN!